Our second celebration of the weekend was with Ed & Rachel at their Southern Maryland wedding back home! We drove home late Friday night after Ashley & Scott’s destination wedding in Corolla to make sure that we were well rested for Rachel & Ed’s big day! We immediately felt drawn to Ed and Rachel when we found out their deep involvement with Jesus as well as their love for travel! Ed has been to 26 states and Rachel had traveled out of the country SIX TIMES before she had even turned 20 years old! They chose to exchange vows during a traditional mass in their beautiful Catholic church here in Southern Maryland. One thing that really stood out to us during the Father’s homily was the verse that Rachel & Ed had chosen to represent their marriage. 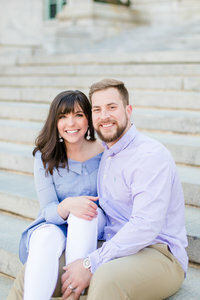 They wanted to be seen as a light and a role model for others in their journey through married life as well as their journey through their life with Jesus. That’s something very important that I think us Christians forget – even though we struggle with our issues and our relationship with Jesus, we have to be out there showing his example and light for others every day! That is our purpose after all! So thank you, Rachel & Ed, for reminding us of that. After their ceremony, the family and friends joined the newlyweds for dinner and dancing at the Belmont Farm in St. Mary’s county – just a few miles from our home! A huge thank you to working with the following vendors on this perfect wedding day! Congratulations Ed & Rachel! Have the best time on your trip to the beach this week and enjoy that much needed time together. We wish you the best in your marriage and can’t wait to see you again soon! If you’d like to browse more Southern Maryland weddings, click through the links below!